Sometimes, real life surpasses in the wildest of dreams. Erik’s “young boy” would later cause the whole country to stop dead in its tracks as soon as he left the starting line. Ingemar Stenmark’s breakthrough came on December 17, 1974 in Madonna di Campiglio, Italy. Just three years later he won the total Alpine World Cup. He has won many other titles including two Olympic gold and one bronze, five World Championship gold, one silver and one bronze. During the “Ingemar era”, visitors to the area would seek out his childhood home and there are stories of how tourists would sneak up and collect pieces of gravel from the drive for souvenirs. He travelled around the world on the alpine ski circuit, from the Alps to the Rocky mountains and Japanese ski resorts and he was joined by his boyhood friend, Stig Strand, who would also boast a couple of World Cup victories. They came during the 1982-83 season when he also won the total slalom cup. Stig came second in the World cup on four occasions, one of which was in his home village of Tärnaby. 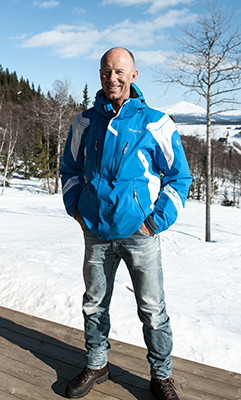 Situated directly below the street where Ingemar grew up, is the home of yet another elite skier - Jens Byggmark. Both houses are less than 500m from the slopes which partly explains why so many good skiers come from Tärnaby, it is second nature to head for the ski lift and just go for a few runs. In 2003 The Swedish Sports Confederation identified the slope where Ingemar learnt to ski as one of the 100 most important historical sports sites in the country. 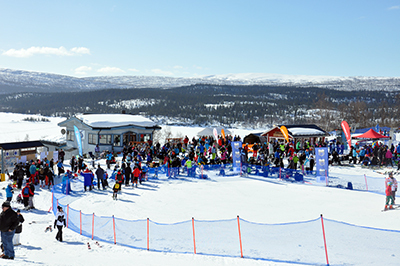 The slope is still used for competitions and is now named after Ingemar, Ingemarbacken. But the slopes of Tärnaby have been the home of alpine skiers for many years, long before Ingemar took the world by storm. The local sports club, Tärna IK was founded in 1928, changing its name to Tärna IK Fjällvinden in 1935 when they amalgamated with Overmans ski club, Fjällvinden. The first slalom competitions were staged in 1937 on the slopes of Laxfjället. Erling "Tärna-Lasse" Larsson pioneered the sport during the 1940s leading the club in to participating in regional competitions. He became the area’s first celebrity. He wore heavy shoes, rough homespun trousers, a Tyrolean hat and a knife. He built roads, working as technician and explosives expert and was known to be particularly fond of beer. But he had a burning passion for skiing and participated in the first designs for the slopes in Tärnaby. He is even legendary for his expertise in ski wax and he produced his own with colour names which he used on his wooden skis. Picture evidence can be seen at Tärnaby Fjällhotell. In Tärna-Lasse’s time one had to tramp up the slope carrying your skis as there were no lifts to reach the summit. With their skis balanced on the luggage carrier younger skiers from the outer lying villages had to cycle (yes, in the middle of winter!) many tens of kilometres to training sessions in Tärnaby. It is from this environment that the tradition of elite skiing in Tärnaby grew. The national breakthrough came in 1952 when Hans Olofsson won the Swedish national championship. He went on to win 8 national titles by 1956. In 1960, Bengt Erik Grahn became the first club member to succeed on the international circuit, taking third place in Wengen. In 1966, he very nearly became World Champion in Portillo, Chile and in 1967 he came second in the World Cup in Kitzbühl. The first female success came in 1972 when Lillian Nilsson won the gold at the National Championships. The Stenmark era began in 1974. Some of the skiers who have enhanced the reputation of Tärnaby have been honoured by having a sloped named after them. There is an incredibly high proportion of Tärnaby’s population that have a national championship ski medal lying around at home or who can boast of representing their country. There is no logical reason that can explain why Tärnaby, with its tiny population has been able to consistently compete at an international elite level for so many years. The village itself has a population of 600 and the whole area from the Norwegian border to Gränsbäcken, 40 km to the south-east, is home to no more than 1500 people. Many journalists from around the world have visited the area over the years to find the secret of our success. By 1983, the successes of the individual skiers made it impossible to overlook Tärnaby as a destination for staging an international event and on February 23, the World Cup was held here for the first time. The competition would focus on slalom and would be held on the very slope that Ingemar and Stig had used since they were boys. It was all set up for a fairy tale ending but as we all know reality is not like that and sport outcomes are often decided by small details, form, a little luck and some misfortune. 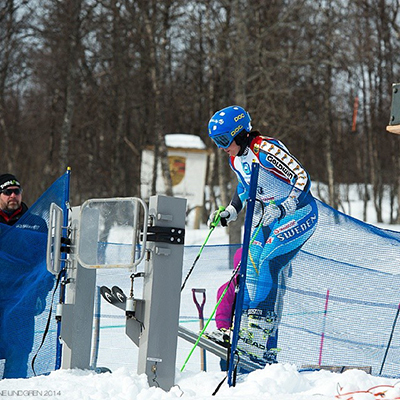 Ingemar cut a gate right at the beginning of his first run and quickly disappeared from the competition area and hordes of journalists, retiring to the sanctity of his childhood home. The locals could still go home happy as Stig Strand managed to produce one his best runs of his career coming second after Andreas Wenzel of Liechtenstein. In third place came Bojan Krizaj and in fourth came Marc Girardelli. Amongst those who also failed to complete two runs were Phil Mahre and Pirmin Zurbriggen. It is still hard to believe that on that day in February 1983, so many of the world’s elite skiers were here in our little village in the middle of the mountains of Lapland. Even Swedes regard our home as distant! In the world of snowboard, 29 year old Hampus Mosesson is an icon. He moved from the south of Sweden to Tärnaby as a young boy where he become pioneer of snowboard techniques. He has won the title of Junior World Champion, Red Bull Big Air in Åre and won Europe’s largest snowboard competition, Air and Style Games. He was voted USA’s “Rookie of the year” in 2005. 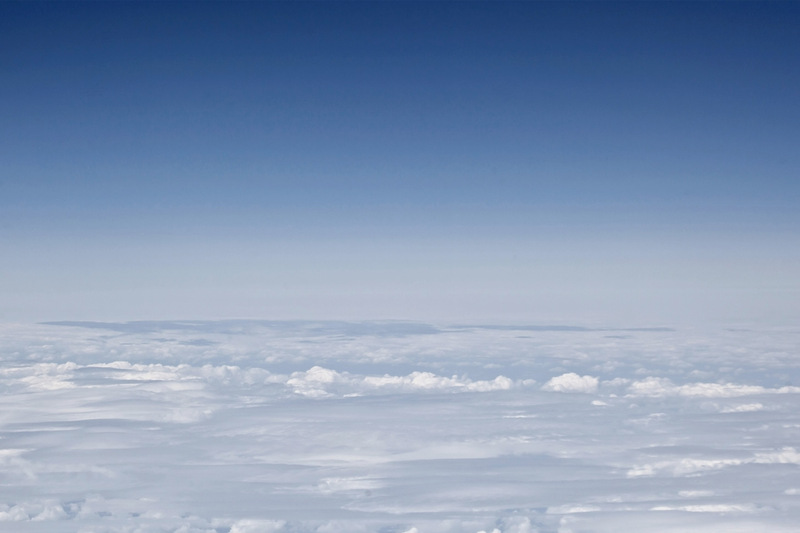 He was noted for his spectacular jumps which he developed to become a specialist in high jumps and filming. During the 2010-11 season he was a member of the national snowboard team. He is regarded as a forerunner and someone who has inspired many others. In Tärnaby, there are courses for both snowboard and alpine skiing at Tärnaby Skidhem. There is also an alpine skiing high school for 16-20 year olds, Tärnaby Alpina Gymnasium. 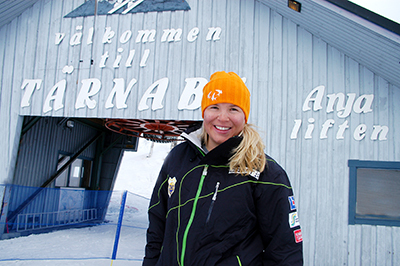 The school also runs ski training college courses under the name Tärnaby Skidakademi. Close to the summit of the Ingemarbacken slope there used to be an old cabin from 1960 that sold refreshments. A Ladies Section of the club was founded in 1967 and since then they have worked voluntarily to collect money towards activities aimed at young skiers, including running the cabin. They used to bake bread in the morning before packing everything they needed and walking up the slope to the cabin. If they were lucky they got a ride on a snowmobile, which was particularly useful when they had to transport containers filled with water. During the day they served fresh bread, waffles, cakes and hot dogs to the hungry guests. This commitment shown by parents, grandparents and other members of the community is a key factor in the success of the club. There are too many examples of extraordinary contributions made by locals to mention - from preparing slopes to baking to lottery sales. One item does deserve a special mention. A wolly hat, the Ingemar wolly hat. The original was made by Ingemar’s cousin Barbro who presented it to him as a gift. She had no idea that it would become the model for a new fashion in ski hats. Barbro was part of the junior national team where everybody knitted their own hats to match the national team’s jerseys. Barbro made hers in 1973 and gave it to her cousin who just suddenly became the king of alpine skiing and everybody wanted a hat like his. The original was blue, white and orange with a teddy bear on it. Since then it has changed colour and pattern and it is still in demand, either for the sake of nostalgia or because it suits the hype of a particular event. The Ingemarbacken slope är homologised for slalom competitions. Both the Anjabacken and Hassebacken slopes are homologised for giant slalom. This means that slopes comply with IFS (International Ski Federation) regulations controlling vertical drop, angle of slope, safety and both start and finishing line areas. The Ingemarbacken slope is situated in the centre of Tärnaby’s ski system, surrounded an all sides by slopes, curves and features sporting the names of the club’s successful skiers including Stig Strand, Bengt Fjällberg, Hasse Olofsson and Åsa Rindefalk-Grahn (Swedish slalom national champion and World Championship participant 1978). Pretty much all the skiers can be found on the ski map. Börje Stenmark won national championship medals and took part in the World Championship 1958, Erland Dahlberg also represented the club at national level and the Lassebacken slope honours the pioneering work of “Tärna Lasse”, the ski wax king. Staffans backe (slope) is named after Staffan Lindgren who won a spectacular downhill on the slopes of Ryfjället. Thomas Ringbrant, who took part in the World Championships and won several national team events has a steep section named after him. Granbacken slope (to the east of Anjaliften) is named after the Grahn brothers who have won many titles between them and they have all taken part in a large number of World Championship, national and Olympic competitions. Bengt-Erik is perhaps the most merited of the brothers. He took part in three Olympics and two World Championships. He was third in Wengen 1965, second in Kitzbühl in 1967 and very nearly won the gold in Chile 1966. Lillians backe, is a slope named after Lillian Nilsson, who won gold in the 1972 national championships in both giant slalom and downhill and the silver in slalom. She won three Swedish National Championship titles in her career. The pass Mickelspasset is named after Sven Mikelsson who also won several team gold medals at the national championships and represented Sweden at the World Championships and Olypmics. Apart from Anjabacken - the slope named after Anja Persson, most of the slopes and features are named after skiers who have long since hung up their skis. There have been many more successes in recent times to be proud of too. Jessica Fjällryd and Nina Hansson won many national championship medals during the 90s and 00s and they also competed in the national team. Jens Byggmark, with two World Cup titles and silver in the World Championships has not had time to have a slope named after him - but it will surely come. When he won his silver medal in Garmisch Partenkirchen 2011, the café at the foot of Ingemarbacken slope was jammed packed with skiers, trainers and parents, despite the fact that a competition was being held. The café had a TV and all eyes were focused on the screen. The roof lifted when he won the silver. His now regarded by the ski loving community as belonging to the elite group of skiers who have represented Tärnaby. That is no easy feat. His victories come as no surprise as his attitude during training as a young boy were appreciated. Everybody knew how much he liked fast skiing and fast motors. Snowmobiling is still one of his favourite hobbys when he returns home. He always, like Anja, has time for the local club TIK Fjällvinden. They both visit evening training sessions, run ski camps and participated in local competitions, well away from the Tv cameras. This close proximity to stars is also a reason why the club has been able to produce so many successful competitors over the years. The younger skiers really believe that they too can succeed. It is nothing they see just on Tv, they live in the same village, go to the same school, ski down the same slopes and every now and again they train together. This helps to dismantle psychological obstacles. When coming home from lessons, training sessions and skiing for fun, the young Anja used to ski through the birch forest from the summit down to her home on the eastern side of Tärnaby. Anjabacken is Tärnaby’s latest slope. It was inaugurated in 2001 and named after the Queen of skiing. She had made her breakthrough a few years earlier at the 1998 World Cup in Mammoth Mountain, USA. Anjabacken is 1300m long with a vertical drop of 330 metres. Many giant slalom competitions are held here. Anja has, just like Ingemar, Stig, Jens and Bengt spent most of their spare time on the slopes of Tärnaby. Her talent for skiing was very obvious at an early age. She beat both the girls and the boys - and she beat them all well! Her competitive edge was always a special factor in her success which took her all the way to the top of skiing. She had always been one of the best skiers on the national stage but with her 19th World Championship medal, won in Garmisch- Partenkirchen in 2011,she became the most merited alpine skier in modern times. This is a summary of her success. 1 Olympic gold, 1 silver, 4 bronze. 7 World Championship gold, 1 silver, 3 bronze, World Team Championship silver in Åre 2007, bronze in Garmisch-Partenkirchen 2011. Anja Pärson has won, lost, crashed, staged a comeback, battled against injuries and criticism and been analysed around the world. Listening to her talk it is obvious that Anja loves the area she comes from. If Tärnaby had to choose a queen there is no doubt that it would be Anja that they would choose. There is no better evidence of this than having a new slope named after her. 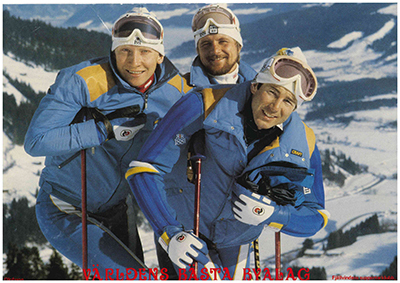 Tärnaby’s skiers have managed to win 132 titles in the Alpine World Cup, (Ingemar Stenmark 86, Anja Pärson 42, Jens Byggmark 2, Stig Strand 2). Tärnaby has also won 3 Olympic gold, 1 silver and 5 bronze. 12 World Championship gold, 3 silver and 5 bronze. Anja and Jens have also competed in the nation team that took silver in 2007 in Åre and the bronze in Garmisch-Partenkirchen in 2011 . Not bad for a small village that has never had wealthy patrons, large industries or adademic centres. For Tärnaby, the gold came using skis, poles and ski boots. Uppdaterad: 08 JUN 2016 02:42 Skribent: Ida Larsson. Översättning Duncan Kemp.